Pineapples from Brazil, chocolate from Switzerland, orange juice from Florida, cheese from France, wine from Chile, and lamb chops from New Zealand – sounds yummy? Maybe. But think about how much fuel it took for these groceries to travel the thousands of miles in order to arrive on your plate, and how much CO2 and other toxic gases were produced in this process. Besides, many of these products are harvested before they’re ripe so that they can withstand the journey around the globe. These reasons have inspired people to start the locavore movement, which supports locally grown foods. 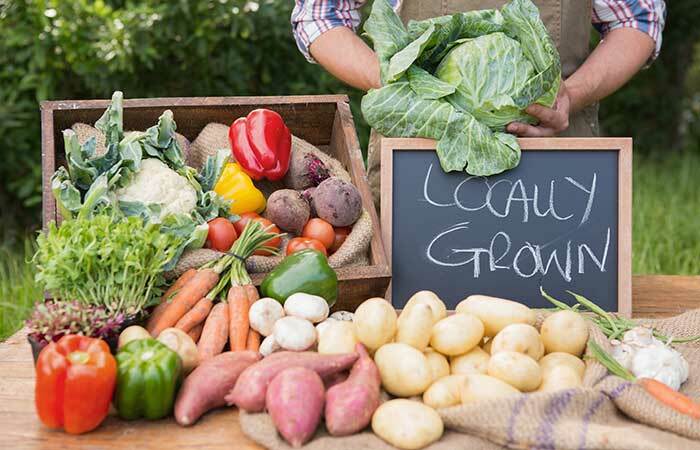 Nowadays, you don’t have to live on a farm to eat fresh, locally grown and produced foods all year round! We have many locavore options available even in the great city of New York. I used to have my own organic vegetable garden and the meals I cooked with those homegrown veggies were among the most delicious I’ve ever tasted. There is no doubt that the taste of a freshly picked sun-ripened tomato is so much more intense than that of a tomato bought in a supermarket. And don’t even start to talk about nutritional content! But for people who live in a city it is usually not practical to grow your own food, unless you own a roof-top terrace or sun-lit backyard. What to do? Community Supported Agriculture (CSA) allows city residents to be a farm member and buy shares from local farms that distribute produce weekly directly from the farm to your table. Some CSAs require members to pickup their shares in a central location and some CSAs deliver directly to your door. Most CSAs offer summer shares which includes weekly supply of different veggies, depending on what’s ripe. Some CSAs include also fruit shares and some offer additional egg shares and other local products. Some CSAs also offer winter shares. Most shares are between $300-1500 for the season. This is a great way to receive your weekly produce without having to “go shopping”. Due to the mix of seasonal produce you will get a variety of nutritious veggies that you most likely would not cook and eat otherwise. This keeps things interesting and helps you be creative by trying new recipes and cooking new combinations of meals. Plus, by eating a larger variety of veggies, you will get a greater variety of nutrients like enzymes and minerals into your body, which strengthens your immune system and improves your overall health, just like nature intended! Buy At The Farmers Market! Besides produce, fruits, and berries, some markets offer a variety of other local products such as meat, fish, eggs, jams, cider, baked goods from bread to pies, cheese, milk, yogurt, soap, flowers, and more. There are a few Local Food Cooperatives in NYC that provide their members with organic and local foods – one in Greenwich Village and several in Brooklyn. Food Co-ops are non-profit member owned and operated grocery stores. Members volunteer a certain time per year to work at the store and in return have voting rights on what products will be ordered and sold at the store. Most co-ops sell only to their members, but the ones in Manhattan and in Flatbush sell to anyone while their members get discounts. As for myself, I just came back from Hellgate Farm – the organic CSA that I joined in Astoria which is close to my house – and said hello to the chickens that provided my eggs for the next few months. I could see how the kale and broccoli are getting big and I can’t wait to bring home the first load of veggies next week! Knowing where your food comes from and creating new recipes with fresh, healthy and organic produce – what could be better than that!? Reading Tip: I highly recommend these books: “In Defense Of Food: An Eater’s Manifesto” and “The Omnivore’s Dilemma: A Natural History Of Four Meals” both by Michael Pollan.